The French sculptor Auguste Rodin created his sculptures largely as volumes existing in space, as materials to be controlled for a variety of surface effects. By doing this he anticipated the aims of many twentieth-century sculptors. 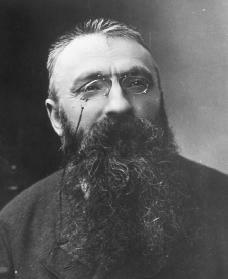 François Auguste Rodin, the son of a police inspector, was born in Paris, France, on November 12, 1840. A shy child, Rodin showed little interest in anything besides drawing, and by the time he turned thirteen he had decided to dedicate his life to becoming an artist. Rodin studied drawing under Horace Lecoq de Boisbaudran and modeling under the sculptor Jean Baptiste Carpeaux at the School of Decorative Arts in Paris (1854–1857). At the same time Rodin studied literature and history at the College de France. Rejected three times by a well-known art school, he supported himself by doing decorative work for ornamentalists and set designers. In 1864 Rodin began to live with the young seamstress Rose Beuret, whom he married the last year of his life. Also in 1864 he completed his Man with a Broken Nose, a bust of an old street porter, which the Salon (French art gallery) rejected. That year he entered the studio of Carrier-Belleuse, a sculptor who worked in the light rococo, or elaborate, mode of the previous century. Rodin remained with Carrier-Belleuse for six years and always spoke warmly of him. In 1870 he and his teacher went to Brussels, Belgium, where they began the sculptural decoration of the Bourse. model. The piece was unusual for the time in that it had no literary or historical meaning. In 1878 Rodin began work on the St. John the Baptist Preaching and various related works, including the Walking Man. Influenced partially by some of Donatello's late works, it was based on numerous poses of the model in constant motion. Rodin raised the very act of walking into a subject worthy of concentrated study. By 1880 Rodin's fame had become international, and that year the French government hired him to design a doorway for the proposed Museum of Decorative Arts. The project, called the Gates of Hell after Dante's (1265–1321) Inferno, occupied Rodin for the rest of his life, and particularly in the next decade, but it was never finished. The gates were cast in their incomplete state in the late 1920s. The Gates of Hell was conceived in the tradition of the great portals (gateways) of Western art, such as Lorenzo Ghiberti's (1378–1455) Gates of Paradise in Florence, Italy. Rodin was unable to plan the gates as a complete organized design and they remained a loose collection of groups. Yet certain of the isolated figures or groups of figures, when enlarged and executed separately, became some of Rodin's finest pieces: Three Shades (1880), Crouching Woman (1885), the Old Courtesan (1885), the Kiss (1886), and the Thinker (1888). From the late 1880s Rodin received many commissions from private individuals for portrait busts and from the state for monuments recognizing well-known people. Among Rodin's portrait busts are those of playwright George Bernard Shaw (1856–1950), writer Henri Rochefort (1830–1913), and poet Charles Baudelaire (1821–1867). In the Head of Baudelaire (1892), as in his other portraits, Rodin went beyond mere realism to catch the inner spirit. Baudelaire's face looks ahead with strict attention, and the eyes seem to be transfixed (concentrated) upon something invisible. Rodin matured slowly, and his first principal work, the Age of Bronze, was not made until he was past thirty-five, yet he achieved fame in his lifetime. After 1900 he knew intimately many of the great men of his time, and his apprentices included Antoine Bourdelle (1861–1929) and Charles Despiau (1874–1946). In 1916 Rodin left his works to the state. He died in Meudon, France, on November 17, 1917. Butler, Ruth. Rodin: The Shape of Genius. New Haven, CT: Yale University Press, 1993. Grunfeld, Frederic R. Rodin: A Biography. New York: Holt, 1987. Sutton, Denys. Triumphant Satyr: The World of Auguste Rodin. New York: Hawthorn Books, 1967.